If you need a way to provide a weather shelter for more than one vehicle or a substantial amount of valuable equipment, triple wide carports just might be the solution to your problem. These expanded size metal shelters offer far more coverage than a traditional metal carport. Alan’s Factory Outlet offers a huge variety of sizes for triple wide carports to serve every possible coverage need, as well as being able to meet your design aesthetic with several custom options. At Alan’s Factory Outlet, our triple wide carports and metal garages are delivered and installed for free in Alabama, Arkansas, California, Colorado, District of Columbia, Florida, Georgia, Illinois, Indiana, Kansas, Kentucky, Louisiana, Maryland, Mississippi, Missouri, New Jersey, New Mexico, New York, North Carolina, Ohio, Oklahoma, Pennsylvania, South Carolina, Tennessee, Texas, Virginia and West Virginia. Our triple wide carports now come certified for FREE with 140 MPH and 45 PSF Snow Load on all new orders. What’s more, we’ll even provide you with free mobile home anchors or cement anchors on every new order of triple wide certified carports. 28'x41'x8' Triple Wide Vertical Roof Metal Carport with 20' closed and 2 side panels on each side closed with gable closed. The bow spacing on triple wide carports is 4' on center. Triple wide carports come in 26', 28' and 30' wide metal carports and metal garages. Our available carport lengths include 21', 26', 31', 36', and 41'. If you need more room, longer carports are available by putting 2 carports end to end. Alan’s Factory Outlet offers free delivery and setup on all triple wide carports and metal garages to AL, AR, CA, CO, DC, FL, GA, IL, IN, KS, KY, LA, MD, MS, MO, NJ, NM, NY, NC, OH, OK, PA, SC, TN, TX, VA and WV. Call us toll-free today at 1-800-488-6903 to find out more about custom options and free delivery for the triple wide carport of your choice! Take a look at the photographs below to learn more about some of the sizes, designs, and colors of triple wide carports that are available from Alan’s Factory Outlet. 26'x26'x8' Triple Wide Regular Roof Style Metal Carports with Both Gables Closed and one panel on each side. Our triple wide carports are huge, but some folks need even more covered space. If you’re looking for a larger size metal carport or fully enclosed metal garage, take a look at our 40' wide metal carports and metal garages. 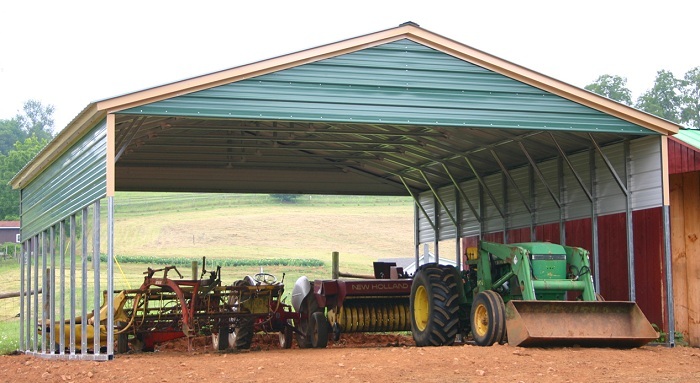 We want you to be happy with your order of a triple wide carport, garage, storage shed, horse barn, or other type of metal storage building or wooden prefab building that suits your individual needs. We are a family-owned business that strives to please you, and we can answer any questions that you may have about custom options for your order. Check out the About Us page to read testimonials from many happy Alan’s Factory Outlet customers!